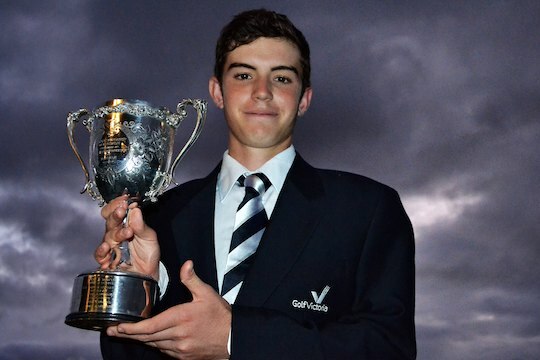 Victorian Ryan Ruffels capped off another fantastic performance with a 72nd hole birdie to win the Australian Boys’ Amateur Championship by three strokes at the St.John Course at The Heritage Golf and Country Club. Ruffels fired rounds of 70-69-68-70 to finish at 11-under par on a rain-soaked course, three clear of New South Welshman Blake Windred who closed with a 4-under par 68. Victorian Brett Coletta finished third, three strokes further back. Ruffels continued on his recent good form which included victory at the recent Riversdale Cup in Melbourne. The 15 year-old’s exemption into the Emirates Australian Open in November will be his second consecutive appearance. “I had so much fun playing at the Aussie Open last year, got to play with some really cool guys and obviously having a good tournament as well. It’s good to have secured that spot,” Ruffels said. Meanwhile Victorian junior Konomi Matsumoto held on to win the Australian Girls’ Amateur Championship in steady rain by one stroke at the Yering Meadows Golf Club. Matsumoto, a member of Victoria Golf Club, finished with rounds of 71-76-76-77 (+8) to defeat Queenslander and Australian Amateur runner-up Karis Davidson by one with another Queenslander, Rebecca Kay in third place at 11-over par. The 14 year-old, who was born in Japan, was thrilled with the win. Matsumoto competed at this year’s ISPS HANDA Women’s Australian Open at Victoria Golf Club via invitation and will return for 2015 championship with full exemption, courtesy of this win.